Back in November I shared a product review for Jesse Tree Treasures O Antiphons and Jesse Tree Ornaments. 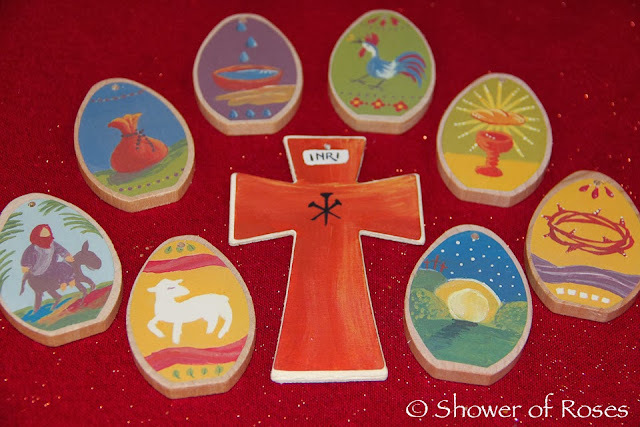 Now, with Lent beginning a week from Wednesday, I was asked to review their lovely Holy Week and Easter Ornaments, along with their new Stations of the Cross Ornaments and Parable Pouch. Once again I am more than happy to recommend these beautifully decoupaged ornaments!
. : Stations of the Cross :. 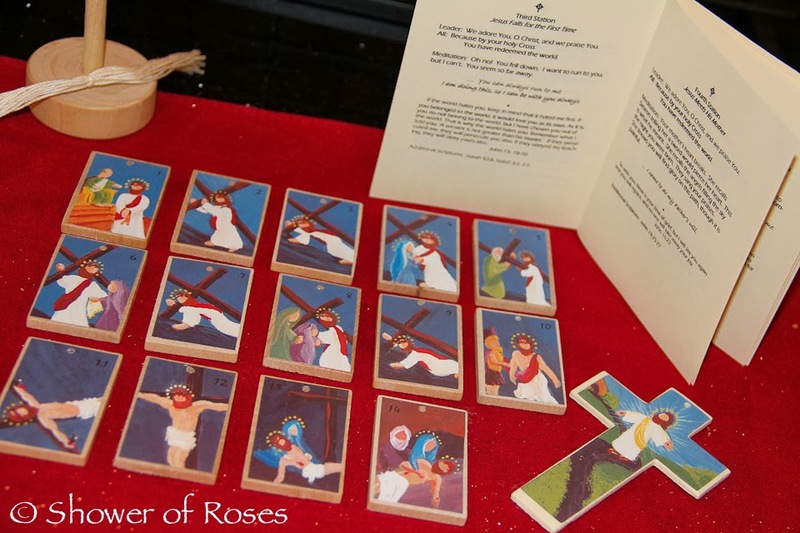 "The Stations of the Cross Set includes: 14 - 1-1/2" x 2" station ornaments, 1 - 4" Resurrection cross, 1-16" Wooden Dowel Tree, cotton strings and a booklet with 15 devotions. The ornaments come nicely boxed, ready for gift giving. " Isn't this set just gorgeous?! I love the simplicity and beauty of each painting. It didn't take me long to assemble the tree and attach the strings to each ornament. We already have a beautiful set of Stations of the Cross that we will display once again during Lent, but these will be such a nice addition, especially for my younger children. My hope is that we will be able to attend Stations of the Cross each Friday morning after Mass, but since my husband will be out of town for half of Lent, I think we might be praying them at home quite a bit as well. This new set, along with our The Way of the Cross for Children DVD, will be such a nice help!
. : Holy Week and Easter :. I especially love this set of Holy Week and Easter Ornaments. The images, created from original folkpainted artwork, make such pretty ornaments. Love them! "These ornaments can be used sequentially during Holy Week starting on Palm Sunday, or sooner with one ornament per day. We've included 8 eggs, 1 cross, and a booklet with 10 devotions. On Easter Sunday, the cross may be flipped around to see flowering Easter lilies, a celebration of our new life in Christ. 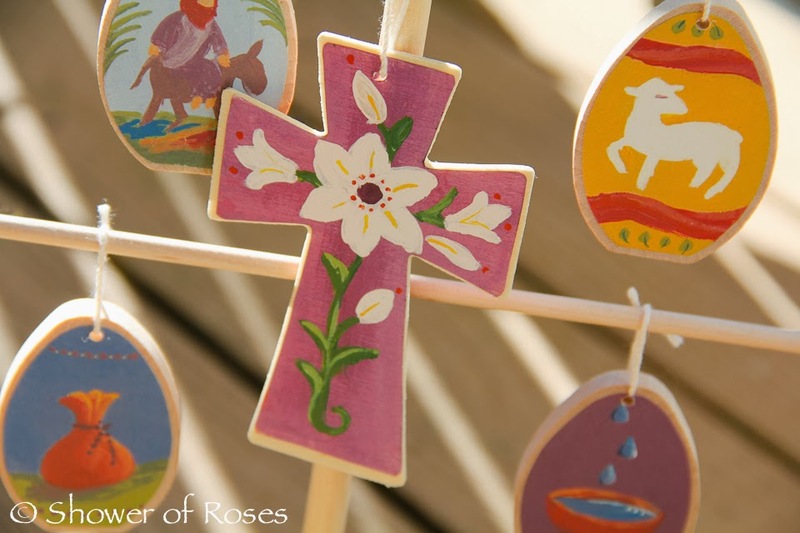 Many of the symbols on the ornaments represent more than one of the events from Holy Week, which allows your family to experience more of the richness of the last week of the earthly life of Christ." According to the Etsy shop, you can "buy both the Stations of the Cross with tree and the Holy Week ornaments and save $5.00! These sets work really beautifully together. They help to travel through Lent and look toward Easter with longing. Then on Easter morning, there is true rejoicing." This last new product would make another great addition to Easter Baskets! Last year I had an Easter Basket that was filled with gifts based on Easter Symbols for the whole family. I am planning on adding this "Parable Pouch" to that basket this Easter. "This Parable Pouch will connect your child to the life, miracles, and parables of Jesus. The 17 smooth wood pieces will captivate them and hold on to their attention. As you read the stories to them from your favorite Bible and explain the symbol, the stories will become a part of each child. They will soon remember that the fish is when Jesus called Peter to be a “fisher of men” and the jar is when Jesus turned the water into wine. The scriptures for each of these stories is listed inside each box. 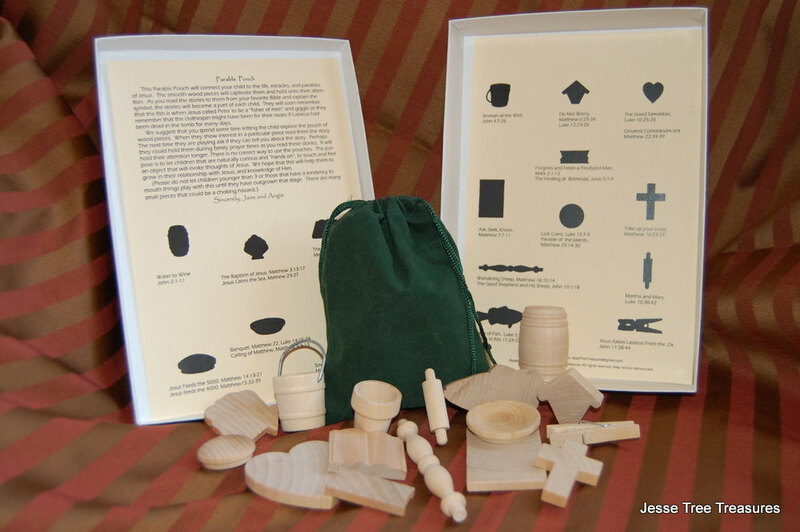 Each set includes: 17 wood shapes, 2 scripture cards, velvet bag, and gift box." Thank you to Jesse Tree Treasures for the sets that were given to us, in exchange for sharing this review. We look forward to adding them to our family traditions for Lent and Easter! Before you go, I have a little giveaway I've been meaning to post. Last year I somehow managed to order a second copy of A Lenten Journey with Jesus Christ & St. Therese of Lisieux. I'd love to send it to one of you to read this Lent! If you'd like to be placed in the drawing just leave a comment on this post by Wednesday night, sharing which of the above three Jesse Tree Treasures sets is your favorite, or your favorite book to read during Lent. I'll draw a name on Thursday, and announce it here in this post. Please make sure you leave me an email address so I can contact you if you are the winner! I would love to be entered. I really like both sets, but the Holy Week and Easter set caught my eye more. Thanks for all your beautiful life you share. God bless. Thanks, Jessica. I would love to win this!!! I love the stations of the cross!! Thanks for the giveaway!! I'd love to win that book!! I'd love to win the book! I looked for an email, but there isn't one on your page :( so I hope you won't mind my asking... is it OK if I'm not Catholic? I no longer decorate as much since my kids are no longer really small, isn't that a shame? I'm trying... but it's a little difficult! Hopefully they will appreciate the efforts you take to make their environment so festive as well as nurturing! My favorite lenten book is the Dolorous Passion of our Lord. I'd love to have this book - thanks for the opportunity! I really like the Stations of the Cross. I would love to be entered for the book. St. Therese is pretty special to me. Wow, who can choose? They're all beautiful and unique! But if I had to pick, I'd say that the Holy Week & Easter ornaments are seriously special and really pretty. God bless! The Stations of the Cross set is my favorite with the parable pouch being a close second. Garagoyle Code is one the books on my must read list for every Lent along with the Magnificat Lenten companion. I would love to be entered in your drawing for the St. Therese book. She has become one of my favorite saints over the past few years. This is so nice!! I've seen this book before (you mentioned it here, I think??) and I've been hoping to read it soon :) Thank you for offering the giveaway. As always, thanks for taking the time to share!!! Wow! My favorite is The Stations of the Cross Ornaments. The pictures are good for a child but are still moving. What a nice set! I'd love to be entered for the book, St. Therese is my Patroness and helped to guide me through my conversion to the Church. My email address is: cj_lapier (at) hotmail (dot) com Thanks for hosting this giveaway, I love reading your Blog, its a real inspiration! God bless you and Our Lady keep you! I would love to have this book; I love St. Therese. I really like the Stations of the Cross ornaments best, but that last set looks great too. My favorite Lenten book is Preperation for Death by St. Alphonsus. my lenten spiritual reading changes from one year to the next. the one thing that remains the same is my lenten bible reading. i read the prophets of the old testament (except Isaiah). Thanks! I'm always looking for new reading for lent. I like the stations of cross the best. How wonderful! I love The Stations of the Cross ornaments! I think I will be ordering them. Last year during Lent a friend and I read, " THe Hidden Power of Kindness." However, I also enjoyed reading,( and will read again this year) "Conversing with God in Lent" by Stephen J. Binz. I am not a homeschool mother. I am a working mother of two and trying to keep my sanity through finding my faith and educating my children with the wonders of our catholic religion. I found your blog by reading the great recipes from catholic cuisine. I would love to read a Lenten journey with Jesus Christ.... Thank you for all the wonderful ideas and information you share. Oh by the way I think all three Jesse tree sets are great, but I think I like the stations of the cross most. It's a tough call, but I think the Holy Week ornaments are my favorite. I would love to be entered into the drawing. And just in case I win, my email address is emilyjean412(at)gmail(dot)com. I love, love, love the Stations of the Cross set! I would also love to win this book. I would love to have this book. I really like the Stations of the Cross ornaments best. The book looks wonderful! And I love the Stations of the Cross set. I have had their Jesse Tree set bookmarked ever since you mentioned it last year...lovely! Your blog always contains such wonderful ideas for living out the Liturgical Year as a family. I've not only found it useful for my own family, but have passed it on to friends and relatives! Thank you for sharing--witnessing a truly Catholic atmosphere within your home has been so refreshing. St. Therese is my personal favorite saint and my daughter's patron. I usually find her Autobiography a great Lenten reading! the movie sounds intersting. thanks for the contest. I think my children would all really enjoy these sets, but I especially like the Holy Week Easter Ornaments. 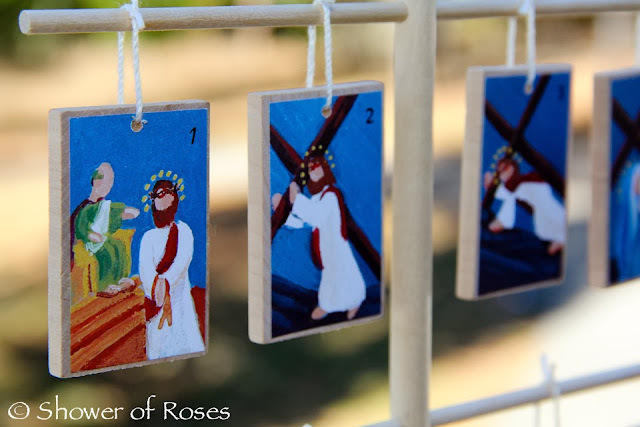 I love the Stations of the Cross ornaments the most, they are stunning in their simplicity. I try to reread The Imitation of Christ every Lent, and also The Life of Christ, by Fulton Sheen. Hi Jessica, they are all so pretty but I do like the brightness of color in the Holy Week and Easter ornaments best. I would love to be entered into your giveaway. Thank you! I ordered the Parable Pouch for my youngest Easter basket to go along with Tomie De Polas Parables of Jesus. and will be adding the Holy Week Easter ornaments to my Easter collection soon. I would love to be added to the giveaway. "Wow, who can choose? They're all beautiful and unique! But if I had to pick, I'd say that the Holy Week & Easter ornaments are seriously special and really pretty. God bless!" I don't think I could choose which set is my favorite. They're all lovely and I enjoy having a daily ritual to help us get closer to the event. I read a different book every year for Lent, so St. Therese would be lovely---as always. Just ordered the etsy items! I'm a sucker for your recommendations! :) and I would love to win the book! I am totally eyeing the parable pouch - I love naked wood items that I can paint myself!! I would love to be entered. I love the Holy Week Ornaments and the Stations of the Cross. They would be such a Blessing to display in my home. I just purchased a new book for the Lenten season, and I'm so excited to start it. It's entitled: Following Christ: A Lenten Reader to Stretch Your Soul. I would love to win the St. Therese book. She has always been someone I have been very close to...and is who my current church is named for. Thank you for the wonderful chance to win...and your wonderful site! The Parable Pouch would be an excellent tool to help my boys keep the teachings of Christ in their minds and hearts. Going through Lent with St. Therese would be such a blessing as well. Thank you, Jessica, and God bless you! Would love to win a giveaway! I like the Stations of the Cross. After ordering the Jesse Tree and the O Antiphons and Christmas; it seems fitting to have the Stations for Lent. But I also love that pouch of parable symbols, too! I am so excited to hear about this website! I am new to homeschooling and excited to look at all the great stuff here. I really like the Holy Week and Easter ornaments above. Please enter me in your giveaway....I also love St Therese and still marvel at all the times she has sent me the sign of a rose in answer to prayer. Keep up the good work! My e-mail is ehelmin@hotmail.com. Thanks so so so much! Please enter me in the give-away, Jessica. My favorite is the Stations of the Cross! Thanks for all your website means to me. I would love to read that book! I have a new devotion to St. Therese and the more I learn about her the more I love her. I love the Stations of the Cross Jesse Tree! A new Lenten devotional would be great. Our parish gives out a Lenten devotional each year and we follow that. I love the Holy Week set, especially the cross with the lilies! Please enter me in the drawing for the book - it looks like a great one! My favorite book to read in Lent is the Life of St. Gemma Galgani. She had such a great devotion to the Passion of Our Lord that it's hard not to be inspired. I definitely recommend it to anyone that's not read it! I think the station of the cross tree would be a wonderful way to show children the way of the cross. Thanks for the chance to win. I love the stations of the cross ornament set! I think I need to get an order in. I love the Stations of the Cross ornaments. What a wonderful idea. Thank you Jessica for the giveaway. Our family loves St. Therese and my second daughter took her name as her confirmation name. It is really hard to pick one because they are all lovely, but I really like the parable pouch as it is a wonderful, Montessori approach to teaching young children. I like the Holy Week ornaments and would like to be entered in the contest. The Stations of the Cross are just gorgeous. me gusto todo !! !quiero incribirme en el concurso, bendiciiones ! The Holy Week ornaments for me. I love to read!!! I keep several books beside my bed two of which are The Story of Christianity (a DK book) and Holyland Journey (for the fabulous pictures). I would love to read A Lenten Journey with Jesus Christ & St. Therese of Lisieux. PS I really enjoy your blog. You have a beautiful family. My favorite Lenten read is The School of Jesus Crucified. Thank you so much for your blog. It is such a great resource!!! I love both sets so much I went over and bought both:) Thanks so much for all the great info. Since we are noe Catholics within the last 5 years your blog has helped me so much. I think they are all great! I love making Lenten concepts more tangible for my children, and these are all so great. I am taking note of others' lenten recommendations! I really like the Holy Week ornaments, but both sets are just beautiful! Please enter me in the drawing as well. A favorite reading for Lent would have to be The Dolorous Passion by Anna Catherine Emmerich. Thanks for the giveaway opportunity. This meditation of Lent through St. Therese sounds most edifying! I love the stations of the cross ornaments! Thank you for all of your posts and for sharing your love of Christ! I love the Stations of the Cross set! It's perfect for us, as we live in an apartment that's only about 1000 square feet (and there's 7 of us). Thanks so much for posting! The Stations of the Cross are so beautiful and I love the idea of the Parable Pouch. St. Therese is my confirmation Saint and I love to read any of her books! I love everything, if I have to pick one, it's the Stations of the Cross ornaments. adriennecorvetteamerica@yahoo.com Thanks. I love the stations of the cross. I am always looking for a way to work through them with my 5 children (ages 2 through 10. I like the visuals and the way they can be hung as you pray them. This is especially helpful for my oldest, with Autism! For lent, I like to read the Dolorous Passion by Catherine Ann Emeric. I like the Holy Week and Easter Ornaments...Although I do like the simplicity of the Stations of the Cross Ornaments too. They are both great! Thank you for a chance to enter the giveaway! Thank you Jessica! They are all beautiful, but I especially love the Holy Week and Easter ornaments -- simple, beautiful, meaningful. Thank you for the book giveaway -- I love your blog. I had a question about the parable pouch. I love the idea, but, do the items cover all the 46? parables int he Bible or just 17 of them do you know? Thank you for this giveaway! I would like to enter. I don't know if I can pick a favorite. They are so beautiful! The Stations are really nice for when you can't make it to Church ... And the Holy Week ones would be so wonderful to just have the children use and ponder throughout that solemn week ... Oh and that book looks like a wonderful Lenten companion. Thank you for the chance to win! Thank you for taking the time to share all you do on your blog, Jessica--our family has benefited so much from it! Oooh the Stations of the Cross please! Many thanks for hosting this giveaway, Natalia. Hi Jessica, Thanks for this chance to win this book. I prefer the Stations of the Cross ornaments. Lovely. I'm attempting to read "The Dolorous Passion of Our Lord Jesus Christ" by A. K. Emmerich this year, and reading some of the Narnia series to the children. Oh I love the stations of the cross one - I need to get a set for my little ones this lent. That book looks wonderful. I enjoy reading the Louis de Wohl books.